on a grab bag mystery piece of CountryStitch hand-dyed evenweave. This is a free chart which can be found here. This is for an exchange hence the white personalisation removal blob! 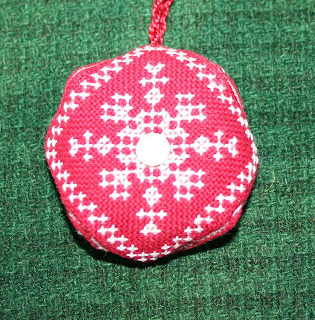 This years JCS Shepherd's Bush ornament all stitched. Not sure how I will make it up as yet. I did change the fabric as the listed fabric was very dark and did not show up the darker colours all that well. 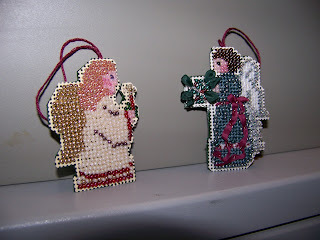 I stitched these two ornaments while I was on vacation during the week of October 13th. Both are from the JCS 2008 Ornament Issue. This is my first post here! I completed this about a week ago, but I have been totally busy. I enjoy decorating for Christmas with a lot of winter/snowman themes...so I can keep everything out longer. :-) The backing fabric is Debbie Mumm and the pattern is Lizzie Kate. I stitched this on 28ct Monaco one over one. 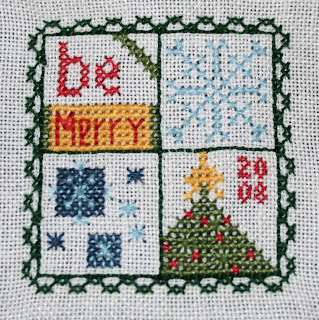 This is from "My Mark Designs" stitched with the recommended DMC threads. Here is my ornament for October. 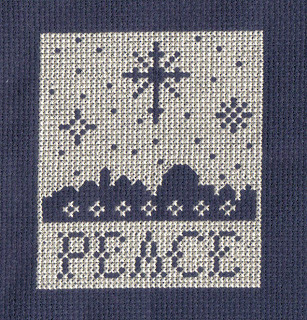 It is called "Peace" and it was designed by Linda Culp Calhoun and adapted for needlework by Donna Vermillion Giampa, and was taken from the 1995 Leisure Arts book "Timeless Ornaments". I found some adorable freebie "Mini-Biscornu" Patterns from Floss Box. I added a simple border, because I thought that the biscornu would be too hard to sew together with the evenweave fabric if it wasn't a little bigger. The button is vintage, from a collection of buttons I found at a craft sale. 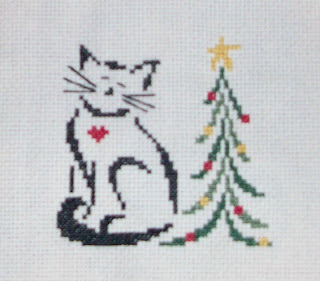 This is an adaptation of "The Cat's Whiskers Studio" Ornament in the 2008 JCS issue. Instead of coloured threads, I used DMC white and Delica silky rainbow beads. 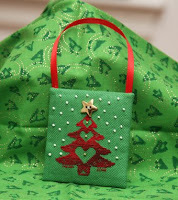 Here is my october christmas ornament - The Christmas Tree. 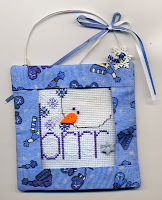 You can get chart and instructions for stitching in my freebies blog. I'll be happy if anyone find it usefull. My name is Eva, from the Chicago area and I am a new contributor, and look forward to sharing my ornament finishes with you. 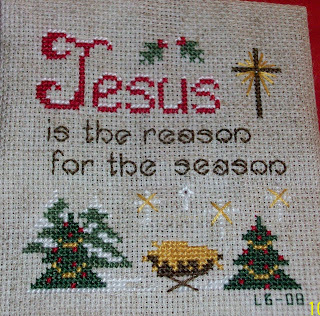 I have been stitching since I was about 6 or 7 years old and have done all forms of needlework, but counted cross stitch is my passion. 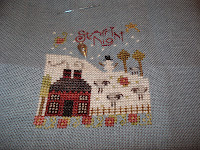 Please feel free to visit my blog to see my WIPs and finishes. 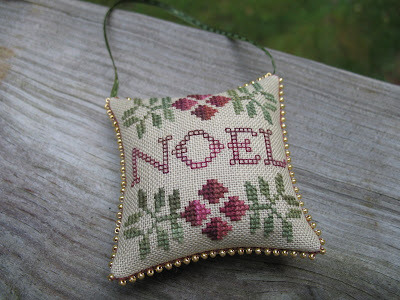 I have stitched a number of ornaments already this year, but they have not been ornamentified yet, so I will show you one that was finished last year. I made 18 or of these and gave them away last year. 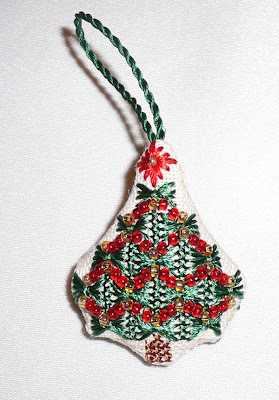 It is the Victorian Christmas Tree ornament by Sue Hillis, and was in one of the Just Cross Stitch Ornament Issue, I just don't remember which one. I'm on vacation this week so I'm hoping to get a few ornaments done. Here is my first one. 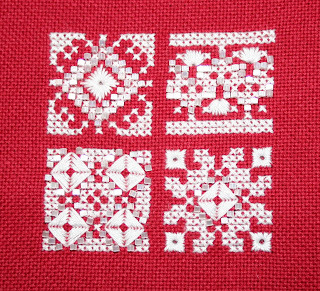 It's stitched on 14 count white Aida using DMC 321. 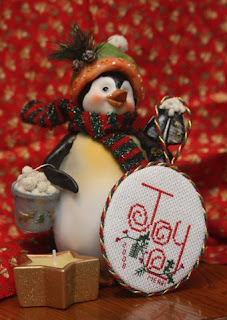 I couldn't resist jumping in and doing an ornament from the new JCS 2008 Ornament issue. Found this pattern on borduurblog and thought I'd try one of them out. There are quite a few and you can design your own also. 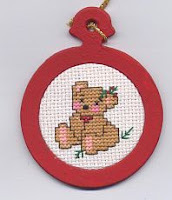 I will be sending mine to Crossstitch for Charity as part of the Christmas Ornament campaign. Quick quick,,, had the time so I did October's ornie for the SAL already! 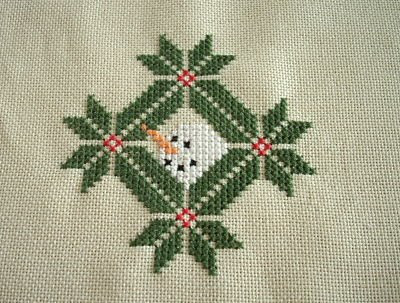 It is one of the snowmen from 74 snowmen pattern by Mary Ellen Yanich from Patternsonline. 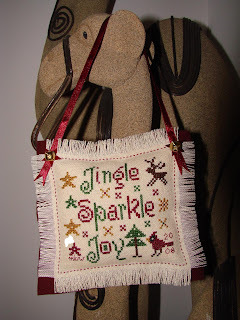 I used DMC floss and substituted Kreinik 002V #4 braid for the PB01. I also used Mill Hill 42011 beads instead of 40557. Stitched on 32 count Kiwi Illusions "Oyster" lugana. Started and finished 30 September - put the last beads on at 11.54pm! 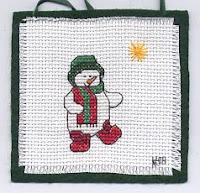 The themes and Featured Stitchers for October have been posted. Enjoy! This is probably old news by now, but the JCS Ornament Issue for 2008 is available. I haven't seen it in chain stores like Michael's or AC Moore, but my LNS had it, so I caved and bought a copy yesterday. You should also be able to order it from your favorite ONS. If for some reason you cannot get it, please let me know and I'll be happy to help you get one. 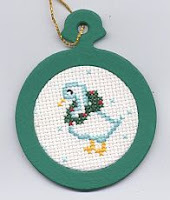 Even more exciting is the fact that one of our fellow stitchers, Monique, has an ornament in the issue. 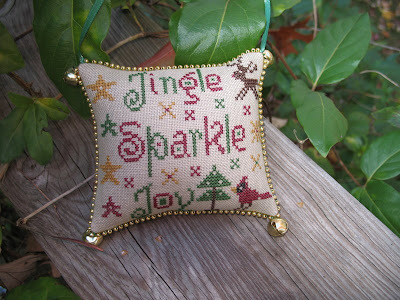 Monique is the fabulous woman behind My Mark Designs, so be sure to check out her ornament in this issue. Congratulations, Monique! September Ornie - Caught Up!